A striking monolith-like structure stands tall and proud as the centrepiece of Waiheke Island’s ‘Headland Sculpture on the Gulf’ walk, #hSOTG 2017. Made from grapevine prunings from Waiheke Island’s vineyards, it’s a creation by environmental artist Chris Booth who name is rather more synonymous with stupendous sculptures in stone. Of Booth’s works winelovers may recognise ‘Wairau Strata’ that stands on a river terrace in Marlborough above the entrance to Seresin Estate however probably better known in New Zealand is his iconic stone ‘Gateway’ arch in Auckland at the Victoria Street entrance to Albert Park and his tribute to the Rainbow Warrior at Matauri Bay in Northland. Check out his website chrisbooth.co.nz for these and many many more. It was a surprise to see a Chris Booth sculpture created from grapevines, and very pleasing for a winelover like me. ‘What a wonderfully creative solution to the disposal of grapevine prunings,’ I thought. Headland Sculpture on the Gulf runs through to February 19th 2017. It takes one to three hours to do the exhibition trail, depending how many stops and photos you take. Before or after you could visit one of the Waiheke Island wineries. Cable Bay is the closest, within walking distance from the trail exit on Nick Johnstone Drive. And that’s handy because most visitors to Waiheke don’t have cars. But there are buses that leave from the Matiatia ferry terminal that will drop you in the vicinity of other wineries if you know where you are going and if you have time. I picked up a copy of Waiheke Marketplace on the ferry boat to find a double page Waiheke Wine spread with map and commentary on 17 wineries. So with pre-planning you could combine the sculptures with a winery tour. But if you can’t fit a winery visit in you can hopefully try a drop of Waiheke wine at the headland Pavilion amongst the hospitality tents on the Matiatia foreshore. Hat tip: Search for and download the hSOTG app before you leave home, and the Waiheke Wineries app as well see http://www.waihekewine.co.nz/our-region/. 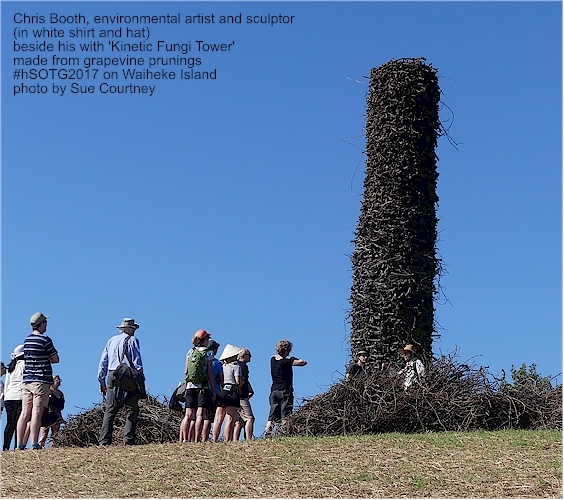 This entry was posted in #nzwine, auckland, regions, waiheke and tagged Cable Bay, ChrisBooth, grapevine prunings, hSOTG, sculptures, Seresin by Sue Courtney. Bookmark the permalink.